This may be the best day hike in Iceland and possibly even in the world. And it is not just us who think so! Fimmvörðuháls (Five Cairns Pass) is one of the most popular hiking routes in Iceland. It is a 23 km hike that lies between the glaciers Eyjafjallajökull and Mýrdalsjökull in southern Iceland. The hike starts at Skógar and ends in the beautiful Þórsmörk Nature Reserve (Thorsmork). 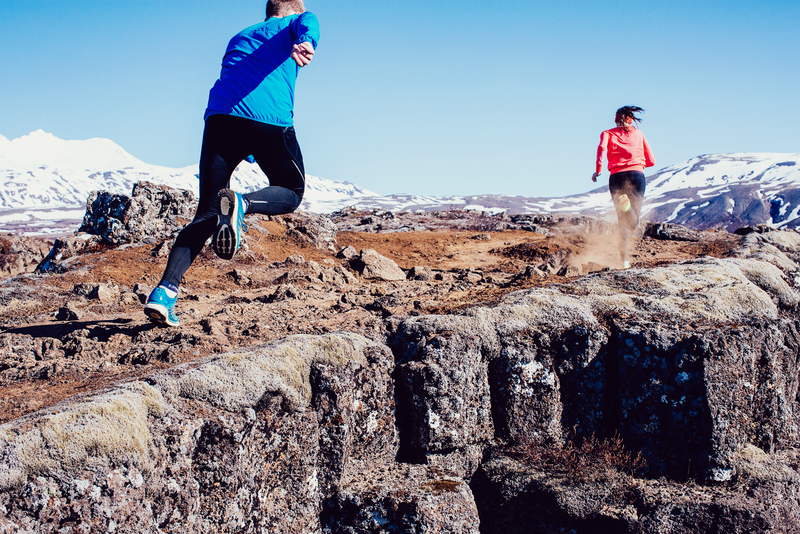 For trail runners visiting Iceland, running this trail could very well be your best day in the country. In the summer time, Iceland is a natural amusement park for outdoor enthusiasts. There are numerous hiking trails all around the country. Many of the most popular hiking routes have not been used a lot by runners, but as trail running keeps growing more runners are emerging on these trails. The Fimmvörðuháls trail is a very challenging run with 1,000 meters of climbing. Only a small part of the trail is on smooth running paths but most part of the trail is uneven and rocky so you have to be focused all the time. The route also takes you through some snow which can be difficult to run through. There are only two or three parts of the route where you can pick up the pace and really let go. You can run from Skógar to Thorsmork or the other way around. It is more common to start at Skógar, mainly because it’s more accessible. Thorsmork can only be reached on specially equipped cars and even then there are rivers to cross that require some experience driving over. The route takes you between two glaciers and an active volcano and can be split into three parts, each with its own characteristics and landscape. The trail starts at the famous waterfall Skógarfoss, one of the most photographed spots in Iceland. Your journey starts by walking up the steep steps to the right of the waterfall. The trail is fairly well marked and relatively easy to follow, and there are usually plenty of other people there too. At the beginning the trail is on soft muddy trails and grass. The river Skógá is on your left hand side as you walk and run steadily uphill. Numerous astonishingly beautiful waterfalls and canyons are passed along the way. After 8 km you cross a bridge over the river and there is a swift change in the landscape as the route takes you into a far more desolate area. Follow the old road slightly to the right after crossing the bridge. Around km 12.5 there is a hut, Baldvinsskáli, where you can have your snacks and use an outdoor toilet. This is the half way point and close by is the highest point of the route, 1043 meters. This part takes you through raw landscape between the two ice caps. Conditions vary but there is always snow on parts of this trail. The trail became even more spectacular after the Eyjafjallajökull eruption in 2010 – yes the one that disrupted air traffic all over Europe! You will run through the new lava fields which flowed from the eruption, a truly amazing sight next to the glacier. The lava field is named Goðahraun (lava of the gods) and you will also see two new craters, Magni and Móði (named after the sons of Thor). You should definitely take the short detour to the top of those craters. We ran this trail at the height of summer 2016, starting in beautiful weather in Skógar, but at the top of the pass it was cold with a lot of rain and low visibility. On this last part of the route you start your descent with vegetation emerging again and the surreal colors of Thorsmork welcome you. On your way down you will need to pass Heljarkambur ridge which is a narrow path down a steep hill with chains to hold on to for security. Thereafter, you run over the flat area of Morinsheiði plateau. You will have to slow your pace while you pass Kattahryggir ridge (“Cat spine ridge”). The last kilometers are again on soft muddy trails with a breathtaking landscape all around you, these are the best running paths of the trail. Þórsmörk means “Thor’s forest” after Thor the Nordic god of thunder. The name makes perfect sense when you get there and see the out of this world valleys, mountains, glaciers and canyons that certainly look like they were created for the gods. For many this is the most beautiful place in all of Iceland. Please note that the route is only accessible from about mid-June until September and even then it should only be hiked or run in favorable weather conditions. Take care and study the weather forecast very closely because there can be heavy winds and snowstorms even in summer, and visibility may drop very quickly. People have gotten lost here so please ask for local advice if you are in doubt. In good conditions you will meet a lot of people hiking the trail as it is very popular in the summer time. We ran in shorts but at the top of the pass longer pants would have been nice as it was really cold and wet. A running backpack with warmer clothes is a very good idea and a good rain jacket a must even if there are no clouds in sight at Skógar. There are of course a few possibilities to execute this running adventure, one suggestion is to take a bus from Reykjavik early in the morning to Skógar. From Básar in Thorsmork there are buses that go to Reykjavik early in the morning and late in the afternoon. We did this in the summer of 2016 and spent a night in Thorsmork afterwards. You can send luggage to Thorsmork with the bus company. The staff at the bus terminal warned us that no responsibility would be taken for our stuff and it might be sent back, but it was all waiting for us when we got to Básar in Thorsmork. Thorsmork is a wonderful place but if you don’t have time to stay you can take the bus straight back from Básar to Reykjavik. Just check the bus schedule and make sure you have enough time. Running the trail should take anywhere between 3 and 5 hours, depending on ability and photo stops! You certainly will not want to leave your camera behind on this adventure. On Saturday nights there is a campfire and a sing-along with all the best known Icelandic songs!